I can't stand it any longer. The temperature is going up to 69 degrees here on Wednesday and already I'm making plans for all the outside chores I want to do. 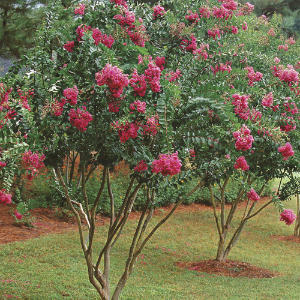 This is a good time to prune my crepe myrtles. I was looking at the Southern Living website﻿ and they refer to the pruning that most people do as "crepe murder" because they butcher the shrub so badly. The website offers great instructions on how to prune them properly. I think I'll also prune my butterfly bush. It may be a little late in the year but I think I'll do it anyway. 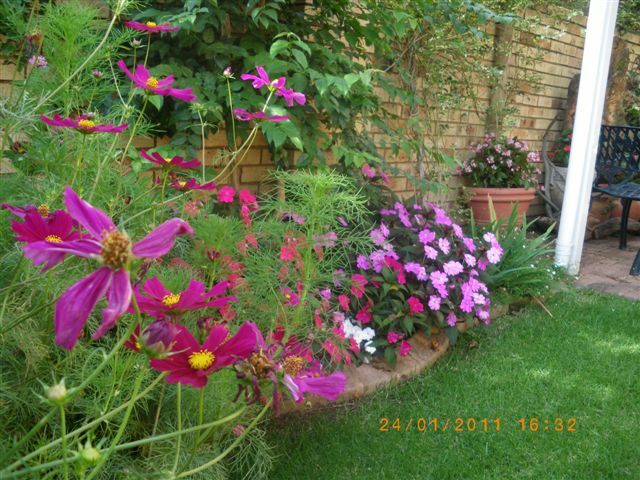 Last year my bush was full of blooms and attracted so many butterflies. Just thinking about these projects is really theraputic for me. I love spring and this will be my first spring since I retired. I plan to enjoy every ray of sunshine and daffodil that blooms! We had a wonderful visit at the Children's Hospital Saturday morning. Hanna rode in this rolling chair so she would be on the same level with the children in wheelchairs. She's gets very heavy for me to hold up for them to pet. Chip was the other dog visiting from our therapy group. He is an adorable cockapoo and loves entertaining the children by playing his piano. These two make quite a team. Their personalities compliment each other. Last night I was cleaning off my desk and came across an envelope of very old pictures. 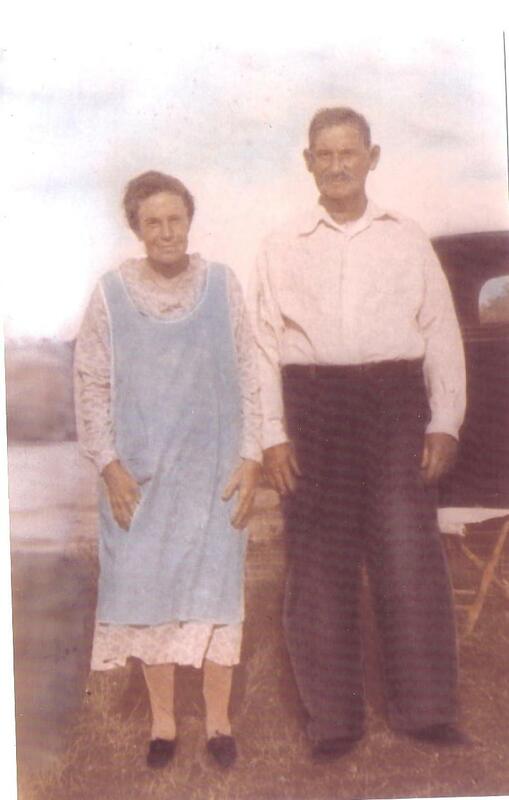 One of which was this picture of my grandparents that I'd like to share with you. Don't they look like the couple that was on the corn flake box many years ago, no disrespect intended. Unfortunately, I didn't know them. She died when I was very young and he passed before I was born. She looks like a very sweet, hard working lady and he is somewhat handsome. It makes me sad that I never had the experience of doing things with my grandparents. I can imagine collecting eggs with her or helping to make biscuits. Hope you all have a great weekend. Hanna and I are off to the Children's Hospital this morning for a visit. We didn't go last month because of the weather. She had a bath last night and we have her Valentine bandana ready. Maybe we'll get some pictures today. I posted this a few months back but I wanted to share it with those of you who joined us recently. 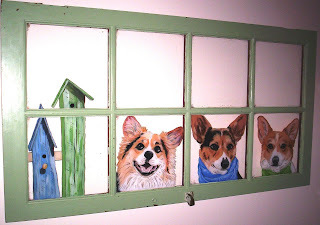 My corgi girls' faces were hand painted on this old window by a artist here in VA. The technique is called "reverse painting" which means that she had to start with the finishing touches and work backwards. Amazing! The window hangs over my sofa and is one of my most prized possessions. I don't think I've mentioned before that I've become friends with Susan over the last several months. She's the type of person you immediately feel like you've known forever. She very witty and tells the most interesting stories. We keep in touch through email. With her permission, I am posting this picture and short note from her. I am honored to have Valentina appear on your blog. I can't think of a nicer place for my ladies to be. 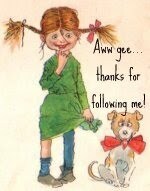 I especially love your minature house and the cat hanging on the toilet! 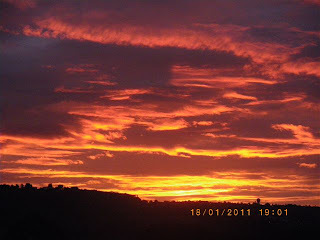 I received an email yesterday from my dear friends who live in South Africa, near the city of Johannesburg. 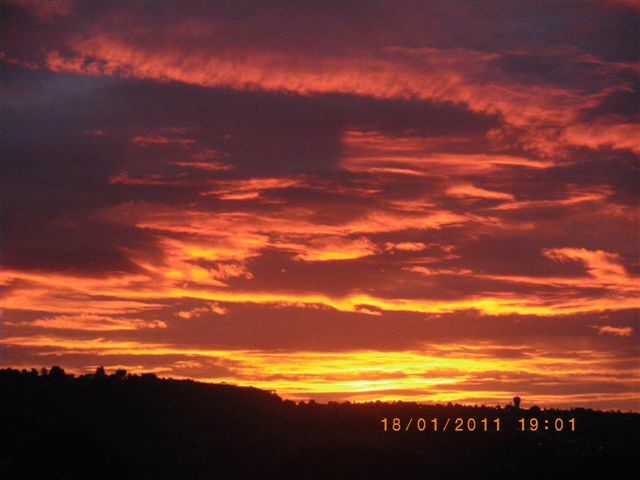 This picture of a gorgeous sunset was taken from their yard last week. 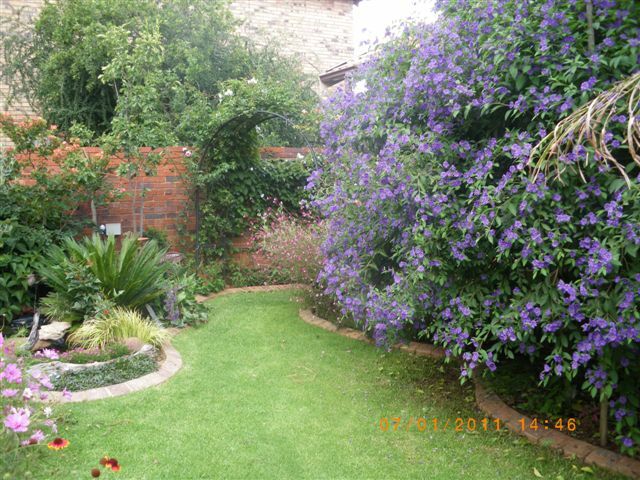 It's summer in South Africa now and their garden is in full bloom. I enjoyed seeing their beautiful flowers and they give me hope that spring is not far away! I don't think I've introduced you to Valentina. I found her at the flea market last fall and she is the latest addition to my Susan Paley lady vase collection. I love her red hair and green eyes! 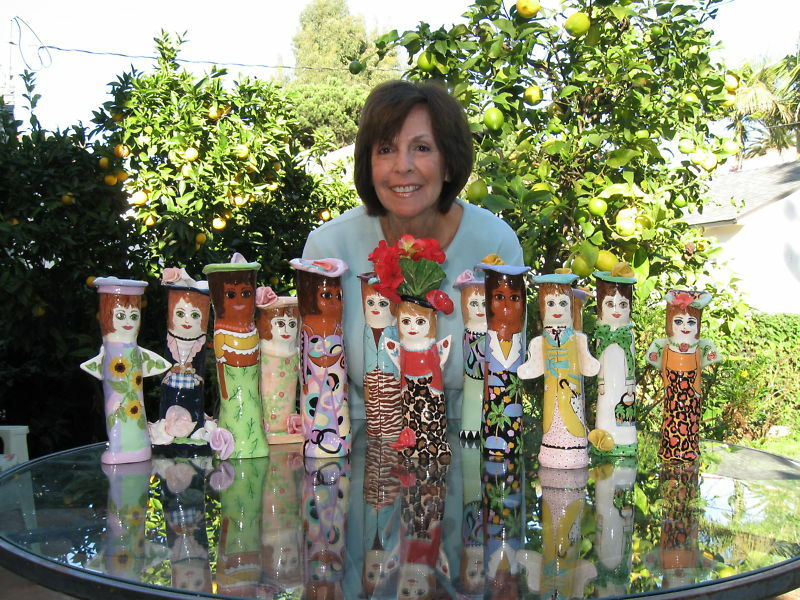 If you've recently joined my blog and are not familiar with Susan Paley, here's a little history of her vases. 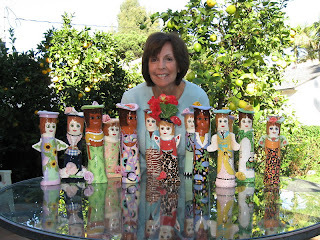 She is an artist who lives in California and designed these cute little ladies for Ganz. They were mass produced by the Ganz company until 2006 when they were retired. Don't you love her little red nails? A friend sent me an old tablerunner with this beautiful hand crocheted trim on each end. The fabric was very worn with several holes. I removed the end trims, made a new fabric runner and attached the trims to it. I also machine embroidered teapots on each end. I was so pleased with the end result and put it on a small buffet in my dining room. The table is still set with my beautiful Christmas china. Notice the Felix the cat clock in the corner. 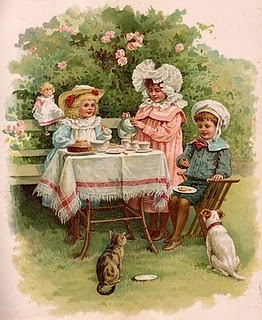 It is definitely not Victorian, but oh so cute! And last but not least, is one of the resident corgis. She was made by miniature artisan, Alice Zinn. The wallpaper in this bathroom is black with twig wreaths and rose colored ribbons. The colors are faded in this picture. A black and white cat is playing in the toilet. I've seen my real cat do this on occasion. Have a great weekend! Only one more week in January! Did anyone else notice how beautiful the full moon was last night? I'll bet it was really pretty at Angela's (West Virginia Treasures) and Amy's (Verde Farm) in West Virginia. Wallpapering this room was quite a job! There are a few imperfections here and there but fortunately they do not show up in the pictures. Finding the toys was so much fun. Did you see the Cabbage Patch Doll? If you're close to my age, you probably remember standing in line to buy them for your children. Don't you just love the giraffe? I need to make a cushion for the rocking chair. I am so pleased with the way the master bedroom in my Victorian dollhouse turned out. 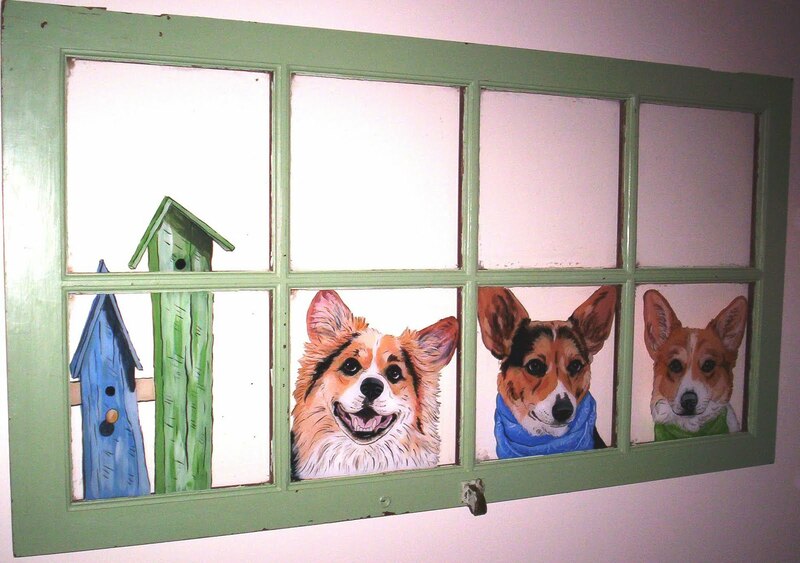 The curtains were made by Linda Wooten of Wooten's Miniatures. 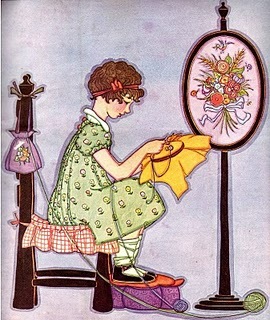 She is a talented seamstress and very reasonable. Of course, there's a black cat on the front porch and a couple corgis in the house. I found these beautiful plates at a thrift shop recently for $3 each. They were made by the Hamilton Collection in 1989. The colors are beautiful and the little girls remind me of my granddaughters. I have them hanging in my dining room. 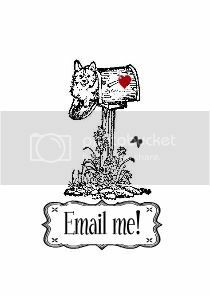 If you haven't already, you have to visit the Stone Gable blog. She has the most beautiful tablescapes and scrumptious looking recipes. Her blog is near the top of my list of favorites. I like the tutorials she offers also. I'm quickly getting burned out with my organizing projects. I guess you could say getting all my cabinets organized was my main New Year's resolution. My mind keeps moving forward to daffodils popping out of the ground, spring peepers, and outside projects. I keep telling myself it's only January, but that doesn't seem to help the restlessness I feel. I must be content to read a few more good books, search for more great blogs and watch OWN network for at least eight more weeks. Several years ago I hosted a "corgi social" in my backyard. The dogs had so much fun and my granddaughters loved being in charge of them. 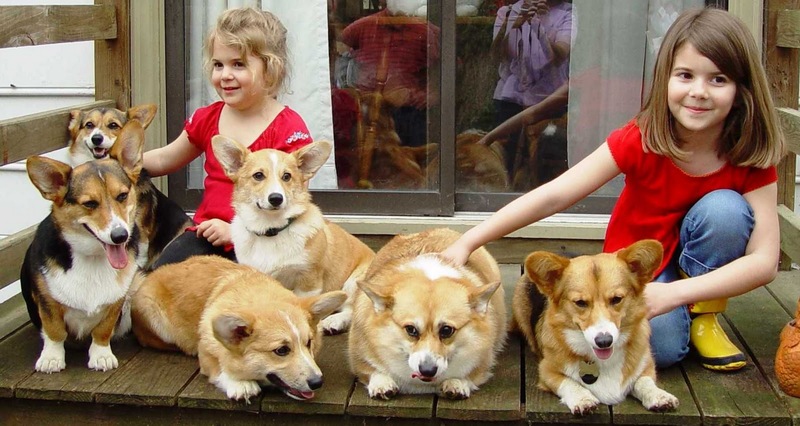 My Hanna is front left and Heidi (with her rather large ears) is sitting by my granddaughter in the red shirt.﻿ I didn't have Arabelle at the time. My daughter put this picture on Facebook today and I had forgotten all about this event. It's so cute I just had to share it with you. I recently made this pillow out of an hand embroidered dresser scarf. Old linens are so beautiful and I love using them in my bedroom. My mother and I embroidered pillowcases when I was a young girl. By the way, if you do machine embroidery, check out the Hatched in Africa website. They have beautiful designs and some of them look like the vintage designs that were already stamped on the fabric. I have owned this rocker for 40 years and the lady who gave it to me was in her 90's at that time. It belonged to her parents who had long been deceased. 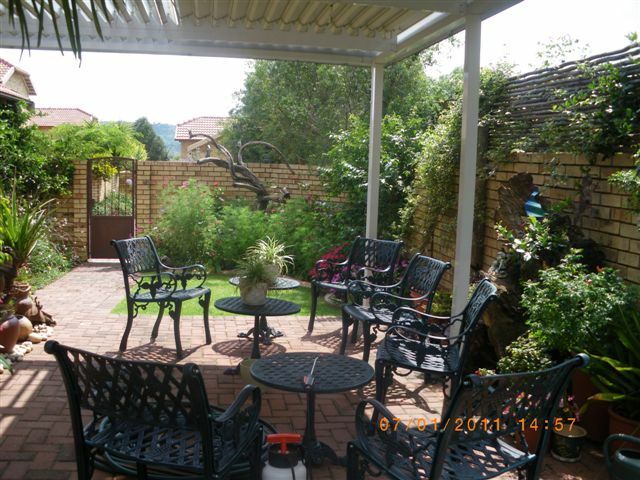 A few pieces of the wicker are broken, but for the most part, it is in excellent condition. Stay warm today, wherever you are. Is anyone else ready for Spring? ﻿﻿My favorite room in my dollhouse is the sewing room. I love the wallpaper and the ironing board with the pinned dress pattern. I thought it would be fun to have a giveaway to celebrate my 50th follower. I had a drawing and the winner is Julie from Saltbox Treasures. I'm sending her a "bed bag". This is my own creation to hang over your bedpost to store your glasses, remote, etc. I hope she will enjoy using it. Your bag is in the mail, Julie!